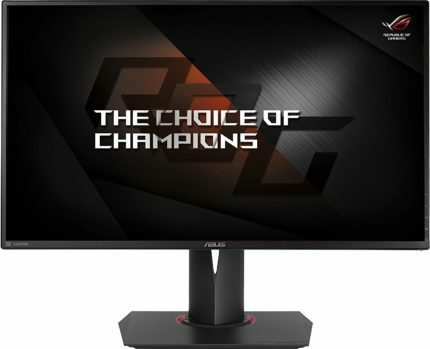 The ASUS ROG SWIFT PG278QR is a new and updated version of the ASUS ROG SWIFT PG278Q, one of the first 144Hz gaming monitors to feature both 1440p and Nvidia G-Sync. Apart from the increased refresh rate which you can overclock to 165Hz, the ASUS PG278QR PC monitor maintains all the key features and qualities of its predecessor with an addition of an extra HDMI 1.4 and an audio line-out port. The design, ergonomics, and image quality are essentially the same except for the superior dynamic contrast ratio of 20M:1 which is utilized by using the pre-calibrated picture presets. The ASUS GameVisual Technology provides you with a several well-optimized presets which you should select depending on what type of game you’re playing as they will enhance your gameplay. These presets include special modes for FPS, RTS/RPG, and Racing games. 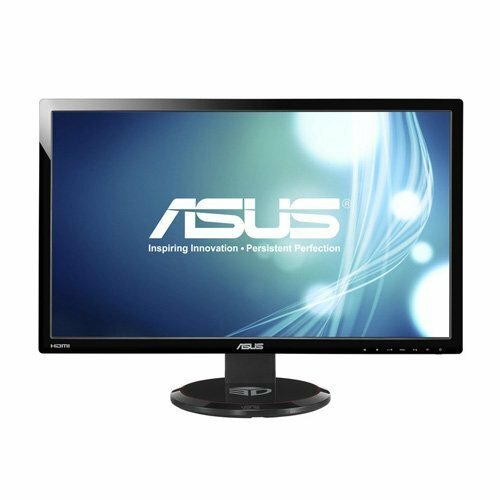 In addition to these presets the ASUS PG278QR display also has Scenery, Cinema, sRGB and User modes for the improved movie watching experience and a higher color detailed image. Moreover, you can manually adjust the level of the harmful blue-light if you find that your eyes are feeling tired after spending a lot of time looking at the screen. GamePlus is yet another gaming feature which allows you to fix four different types of crosshairs on your screen and thus gain the edge over your opponents with a more precise and deadly aim. Moreover, you can place a timer and an FPS counter to your screen and monitor the performance of your GPU. The OSD buttons are placed on the right backside of the monitor and include a power button, a button for the GamePlus feature, and a 5-axis joystick for quick and easy navigation through the menu. Unlike its predecessor, the ASUS PG278QR gaming monitor doesn’t have a turbo key to toggle between different refresh rates; instead, you in the OSD menu, you can effortlessly overclock it to 165Hz. In the box of the ASUS PG278QR 1440p display, you will receive a power cord, a power adapter, a DisplayPort cable, a USB3.0 cable, an HDMI cable, a quick start guide and a CD with drivers and information. If your PC is powered by a compatible Nvidia graphics card you will be able to synchronize the frame rates of your monitor with the GPU using the Nvidia G-Sync feature. By doing so, you will be able to overclock the monitor’s Hz rate up to 165Hz and achieve a more stable FPS rate. The higher Hz rate delivers lesser lag and screen tearing or stuttering even at the maxed out settings which is mandatory for competitive gaming. However, if your graphics card is powerful enough to maintain the high FPS rate on its own, then you might want to enable the Ultra Low Motion Blur feature instead of the G-Sync. The ULMB feature cannot be active at the same time the G-Sync is, and it should be used if you experience image blurring and ghosting as it will get rid of it for good. While the ASUS PG278QR G-Sync monitor comes with nearly perfect calibrated settings, in order to achieve more accurate colors it’s advisable to additionally calibrate them if you’re not satisfied with the color reproduction. You should also keep in the mind the viewing angles of the monitor which amount to 170/160 degrees, although as long as you’re sitting in front of the monitor, the viewing angles aren’t an issue. 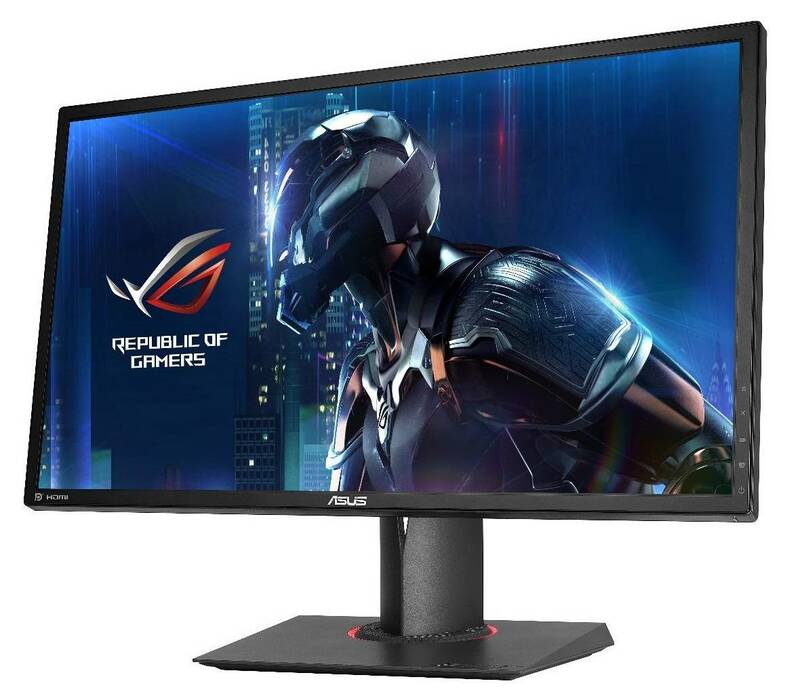 For those who prefer better image quality with precise and consistent colors, there’s a version of the monitor with an IPS panel, the ASUS ROG SWIFT PG279Q. 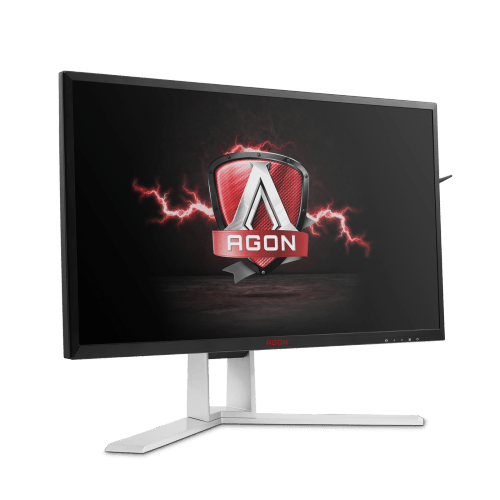 It’s essentially the same 165Hz gaming monitor, however, its better color reproduction comes at the cost of the response time speed which makes it less appealing to the high-end competitive gamers. On the other hand, the IPS panel offers the flawless 178-degree viewing angles and its 4ms response time isn’t all that noticeable nor bothersome to the casual players. The IPS model is also about $100 pricier for that matter. 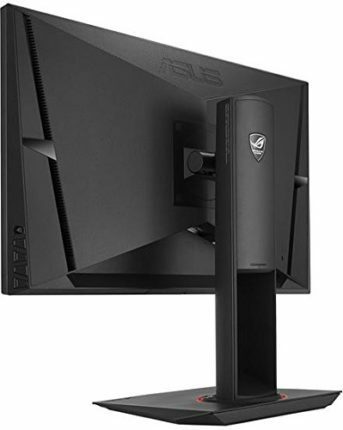 The cabinet of the ASUS PG278QR has a nice matte black color which gives the monitor the modern and gamer-like look. The base of the monitor has a circular LED light which shines or pulsates in a warm red color. The screen is covered with a matte finish which eliminates glaring. At the back of the monitor are the air vents which keep the monitor cool even after long playing hours. In addition to all these aesthetic virtues, the monitor has very thin bezels of only 6mm. Overall, the appearance of the monitor is simply gorgeous, and so is the image it produces. The ASUS PG278QR offers a wide range of ergonomic functionalities ensuring that you find just the perfect spot for your monitor and comfortable playing for hours to an end. This 165Hz gaming monitor can be tilted by 25 degrees, height adjusted by 120mm, pivoted by 90 degrees and swiveled to the left and right by 60 degrees. Additionally, the monitor is VESA mount compatible allowing you to securely and effortlessly place it on the wall. The ultra-thin bezels of only 6mm make it ideal for multi-display setup as well. The ASUS PG278QR monitor features an HDMI 1.4 port and the DisplayPort 1.2 for the Nvidia G-Sync feature. Along these ports, you will also have two USB 3.0 ports for easy connecting of your keyboard and mouse devices and an audio line-out port. Professional gamers whether of RTS, RPG, FPS or Sports gaming genres will all have the ultimate gaming experience with high-quality graphics and fluid gameplay. The quick response time, high Hz rate, G-Sync, and Ultra Motion Blur features make for the state of the art performance in games. As the ASUS PG278QR has a TN panel, professional designers and photographers will, obviously, have to look for a more color accurate monitor with an IPS panel. The ASUS PG278QR delivers the top-notch response time, Hz rate and exclusive gaming features including the Nvidia G-Sync technology which will immerse you into a flawless gaming experience while giving you the edge over your opponents.